A hip fracture or break of the upper part of the femur occurs after a fall or as the result of major impact to the upper leg. A high impact blow, such as a traffic accident, usually happens to young people. Among people with osteoporosis a break may occur as a result of a simple fall. Osteoporosis or bone decalcification typically occur among the elderly. The presence of osteoporosis is examined using a bone density scan and is treatable. Your general practitioner can support you in this matter. 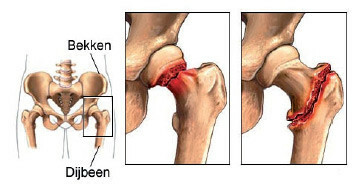 In the case of hip fractures a differentiation is made depending on the position of the break. We differentiate between two major groups. There are several other types of fractures of the femur. A differentiation is made between breaks that occur in the hip capsule (the subcapital or transcervical fractures) and fractures that occur just outside the hip capsule (intertrochanteric-subtrochanteric fractures). A hip fracture almost always has to be treated surgically. Treatment for a hip fracture depends on the position of the fracture. A break inside the hip capsule (subcapital or transcervical fracture (1)) is treated with screw osteosynthesis (fitting three screws) or with a hip replacement. Osteosynthesis can only be used in young patients with a non-displaced fracture. A hip prosthesis is recommended in all other cases. In the case of a break outside the joint capsule (intertrochanteric (2) or subtrochanteric (3) break) plate-and-screw osteosynthesis or an intramedullary nail is chosen. Repairing a hip fracture is a long process in which a great deal of effort is required from the patient. The total healing period is difficult to estimate beforehand since it is highly dependent on the general condition. The healing process generally lasts three to four months, followed by around six months during which the patient should regain his or her strength. During hospitalisation the way in which the aftercare can be optimised is examined on an individual basis.